THE HIGH KINGS OF ALL IRELAND! THE CATHEDRAL city of Armagh was the venue for the meeting of SFAI and Northern Ireland Boys Association champions from 13 to 16. 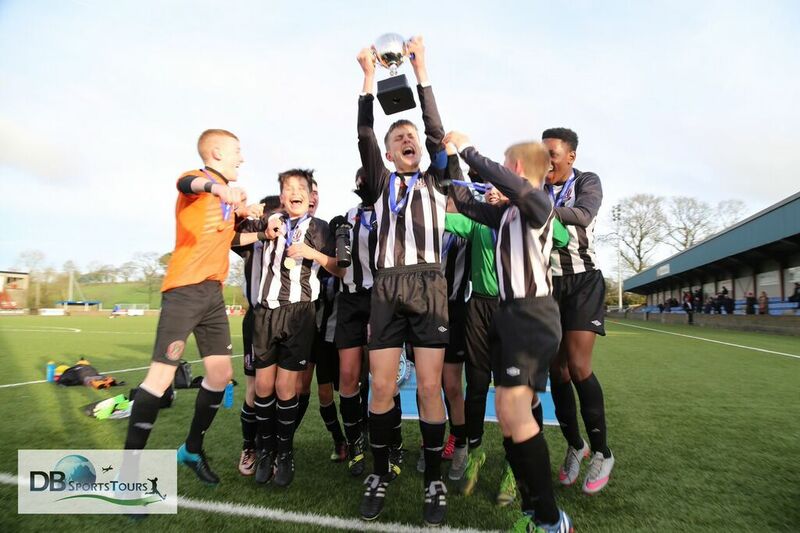 Sponsored by DB Sports and hosted in conjunctions with the Schoolboy football Association of Ireland and the NIBFA the action at Holm Park – home of Armagh City FC – was out of the top drawer with clubs eager to claim the prized title of ‘All-Ireland’ champions. “The competition has grown by the year said,” David Berber of DB Sports. “We are grateful for the support of both associations and they have brought into the ideals and bringing the champions from the Republic of Ireland together to play the champions of Northern Ireland and we have not been disappointed with the standard of fare on offer,” added Berber. This was first time the event had been hosted in Northern Ireland having been domiciled in Oriel Park for the previous four years of the competition. `Holm Park’s 4G all-weather surface was ideal for the teams who tried to get the ball down and play football at all times as parents, neutrals and a bevy of scouts from north and south took in the unfolding action. It was left to St Kevin’s Boys and Linfield to kick off proceedings with the opening 11am fixture but they were quickly into their stride and the boys from Whitehall were soon imposing themselves on their vaunted Belfast rivals. The tangerine and blacks had good use of the ball and as the pressure mounted an incisive run from Bosun Lawal unlocked the Linfield rear guard and Eoin Green picked his spot to curl the ball past Callum Rooney to the back of the net in the 11th minute. It looked as if St Kevin’s Boys would add to their tally given the amount of possession they enjoyed but on the turnaround it was the light blues who showed more of a cutting edge and Craig Farquhar and Oliver McGrath led Linfield back into contention but their hopes of parity were eventually undone as substitute Cian McCracken’s speculative shot in the 52nd minute blindsided Rooney in the Linfield goal. Left back Len O’Sullivan of St Kevin’s picked up the Man of the Match Awarded while joint skippers Dylan Quinn and Lee Kavanagh accepted the DB Sports Cup from Darren Scully if the sponsors. Linfield were to suffer defeat on the double at Under 14 level but St Joseph’s Boys had to work extremely hard to claim the title. The only goal of the tight encounter came in the 55th minute when Callum Perry’s well executed free kick beat the despairing dive of David Walsh in the Linfield Goal. Skipper Cian Kelly of St Joseph’s Boys claimed the Man of the Match Award. Belvedere FC U15’s had to field without four of their international players and it had a telling effect as they lost 3-0 to Cliftonville FC. The opening goal came after just 15 seconds of play with James McDonnell finding the net. 15 minutes in centre forward Lee O’Brien doubled for Cliftonville and the same player added the second and Cliftonville’s third in the 49th minute to claim the only NIBFA title on the day. Lee O’Brien was a popular choice for the Man of the Match Award. St Joseph’s Boys made it a glorious double when they edged out St Oliver Plunkett’s 3-2 in arguably the best game of the day. Jonathan Afolabii gave SJB the lead in the 32nd minute and Promise Omochere added a second on 37 minutes. St Oliver Plunkett’s got back into the game courtesy of an own goal on 45 minutes but Brandon Kavanagh added a third for Joey’s before Jay McGlinchey reduced the arrears to the minimum on the hour but the Sallynoggin boys held firm to claim the All-Ireland title. Midfielder Aaron Bolger was named Man of the Match Award. USUALLY the best ideas invariably are the simplest. Such is the dynamic that has come together to provide us with the DB Sports Champions Cup and competition founder Dave Berber hailed both the success and future viability as the best schoolboy talent came together from both sides of the border to put on a feast of entertaining football at Holm Park. “There was an obvious opportunity to bring people together through sport and that’s exactly what’s happened here today” said a delighted Berber. With the backing of both schoolboy organisations north and south of the border, friendships are being forged and strengthened. Said SFAI Chairman John Earley: “We are fully supportive of this venture and it is an exciting concept to bring the cream of talent on this island together through sporting pursuit.” Certainly, the four games at Armagh were played in a very fair and sporting way with respect on show from players and management alike as well as the appreciative supporters. Another commendable feature was excellent standard of match officials which were provided by the Northern Ireland referees association. Click on the image below to hear Our Managing Director speaking to Eamon Scott from the Herald Striker on the success of the DB Sports Champions Cup ….